A portable application is a program which do not need to be installed. So it won’t modify your computer’s configuration information. If you want to use DriverEasy in the portable way, you can follow steps below to learn how to use it. 1. Click here to download the latest version of DriverEasy to your computer. 2. Double-click on the downloaded file and follow instructions to install DriverEasy. 3. After installation completes, you will find the shortcut of DriverEasy on your desktop. Right-click on the shortcut. Select Properties and click on Shortcut tab. Click on Open File Location to open the location of DriverEasy. 4. 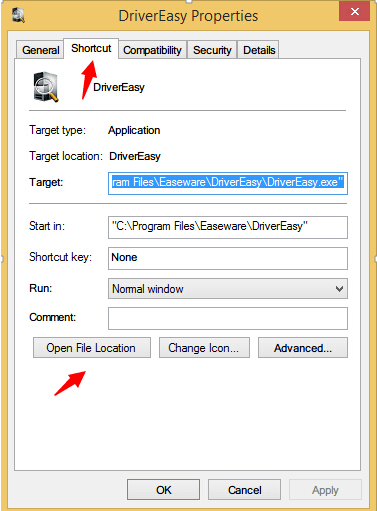 Double-click on DriverEasy.exe in the file to run the portable version. 5. If you need to use the portable version on other computers, you can go back to folder Easeware. Copy the folder DriverEasy to other computers then open DriverEasy.exe. Note: To run the Portable version, you need to install “.Net Framework”. For Driver Easy 4.x versions and previous versions, install “.Net Framework 2.0”. If your PC is running 32-bit operating system, click here to download “.Net Framework 2.0”. If your PC is running 64-bit, click here to download it. For 5.0 and later versions, install .Net Framework 3.5 SP1. DriverEasy Technical Customer Support provides further assistance to assist Professional User regarding driver issues. As DriverEasy Professional User, please feel free to email us with your error screenshot to support@drivereasy.com if you need further assistance.